This post marks 122 straight days with a new educational blog post. With so many folks getting in the habit of using our B&H and Amazon links why quit now? To show your appreciation for my efforts here, we do ask that you use our the B&H and Amazon affiliate links on the right side of the blog for all of your purchases. Please check the availability of all photographic accessories in the BIRDS AS ART Online Store. We sell only what I use and depend on. We will not sell you junk. We know what you need to make creating great images easy and fun. And we are always glad to answer your gear questions via e-mail. This image was created at Gatorland on Saturday past on a dark, dreary morning with the Gitzo 3532 LS carbon fiber tripod, the Mongoose M3.6 head, the Canon EF 600mm f/4L IS II USM lens, the Canon Extender EF 2X III, and the Canon EOS-1D X Digital SLR camera body. ISO 800. Evaluative metering +1 2/3 stops: 1/60 sec. at f/18 in Manual mode. Color Temperature: AWB. Fill flash with the Better Beamer at -3 stops in ETTL, the Canon Speedlite 600EX-RT with the Canon CP-E4 Compact Battery Pack for faster re-charging times. Mongoose Integrated Flash Arm with the Canon OC-E3 Off Camera Shoe Cord 3. Central sensor (by necessity) Expand/AI Servo/Rear Focus on the middle of the lores active at the moment of exposure. Click here if you missed the Rear Focus Tutorial. Be sure to click on the chick to see a larger version. His comment inspired today’s blog post. For you, selling the 300 II would be a good idea unless the 200-400 proves too heavy to hand hold for long flight photography sessions where you cannot use a tripod…. On trips where I do not take the 600 II, I bring both the 200-400 and the 300 II so that I have a back-up in case of a smashing lens disaster. For me, it would be insanity for anyone to sell the 600II. The 600 gives me 840 with lightning fast AF and sharp 1200mm when I need it. Which is often. A lot depends on where and what you will be photographing. The 200-400 is great in the Galapagos, on Southern Oceans cruises, on Japan in Winter trips, and in Florida. I leave the 600 at home for the Galapagos and Southern Oceans trips but would not be caught dead without it in Japan, here in my home state, pretty much everywhere else that I go to photograph birds. Your call :). In short, the 200-400 and the 600 II are completely different, very specialized tools. With the 200-400 giving you all AF sensors from 200-560 the 600 begins where the 2-4 ends. Add to that 840 and 1200 (for those who are capable of creating sharp images with the 2X III TC), and it is obvious they make a perfect combination that covers all focal lengths from 200-1200mm. Throw in the 70-200 II and the 24-70 and you have yourself a nice kit. This Tricolored Heron image was created at Gatorland with the Canon EF 200-400mm f/4L IS USM Lens with Internal 1.4x Extender (hand held at 219mm) and the Canon EOS-1D X. ISO 800. Evaluative metering -+1/3 stop as framed: 1/320 sec. at f/5.6 in Manual mode. AWB. One sensor below the central Sensor/AI Servo-Surround/Rear Focus AF on the bird’s neck active at the moment of exposure yielded a pleasing image design with the bird in the lower part of the frame. Practicing so that you are able to change AF sensors almost instantly is an important skill to work on. Click here to see the latest version of the Rear Focus Tutorial. Click on the image to see a larger version. Learn everything there is to know about the 1D X and 5D III AF systems including how to manage the various AF Area Selection Modes, when to use which one, and several ways to move the AF sensor around in the 1D X AF Guide and the 5D Mark III User’s Guide. In many situations, I need both of these great lenses at hand in order to have almost unlimited framing options available. 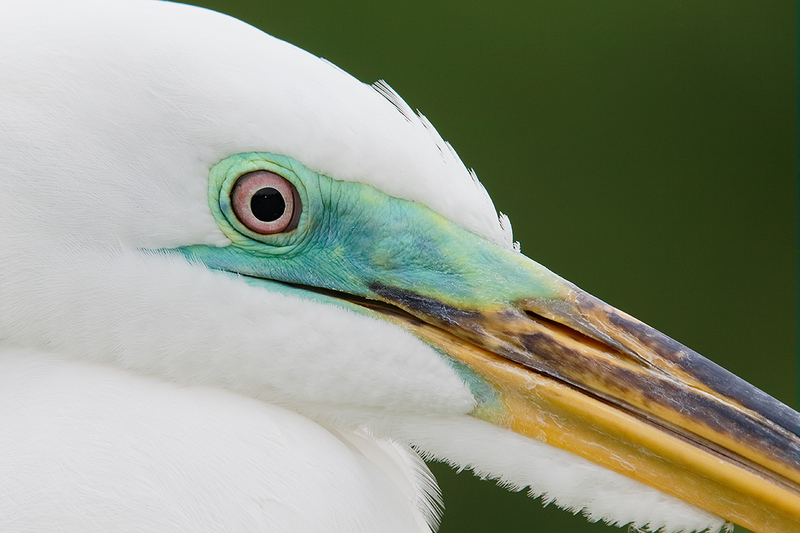 For the Great Egret image that opened this blog post, I went with the big gun and the 2XIII TC to create an image that showed off the incredible beauty and details of the face, lores, and bill. I placed the Canon Extension Tube EF 25 II behind the 2X for closer focus while maintaining AF. As the AF system is slowed by the loss of light from the two accessories I pre-focused manually and in addition, to keep the system from hunting, I turned the inaptly named “Lens drive when AF impossible” to “Stop focus search/OFF.” Though most folks have no clue as to how to use this properly, it can be extremely valuable in the right situation. It is so important to me that I have registered it as one of my My Menu items. You can learn exactly how, when, and why to use it in our 1D X AF Guide, the 5D Mark III User’s Guide, and the Mark IV User’s Guide. I am not sure about the 7D; I would appreciate it if someone would let me know whether “Lens drive when AF impossible” is covered in the 7D User’s Guide. As I was working the Great Egret with the 600II/2X/1D X combo, the 200-400 rested flat on the wet boardwalk waiting for me to grab it. I turned my head to my left to check out the activity at the tricolored nest to my left. The nest had four beautiful light blue eggs. I had been photographing it off and on all morning so I knew in advance that Evaluative metering +1/3 stop in Av mode would give me something that I could work with. As it was getting darker each hour this is another example of a situation where Av mode soundly trumps Manual mode. . Whenever the bird would stand up, I’d grab the 2-4 and get to work in a moment. When a Great Egret landed right above her nest, she rose in protest so I grabbed my quasi-wide angle lens, disengaged the TC, moved the AF point down one row, and created the image here showing the bird displaying against the large white intruder above. As you can see having the two lenses available allowed me to create two vastly different images in the same minute. But in addition to owning the right gear and having it at hand lots of thinking and skill came into play. 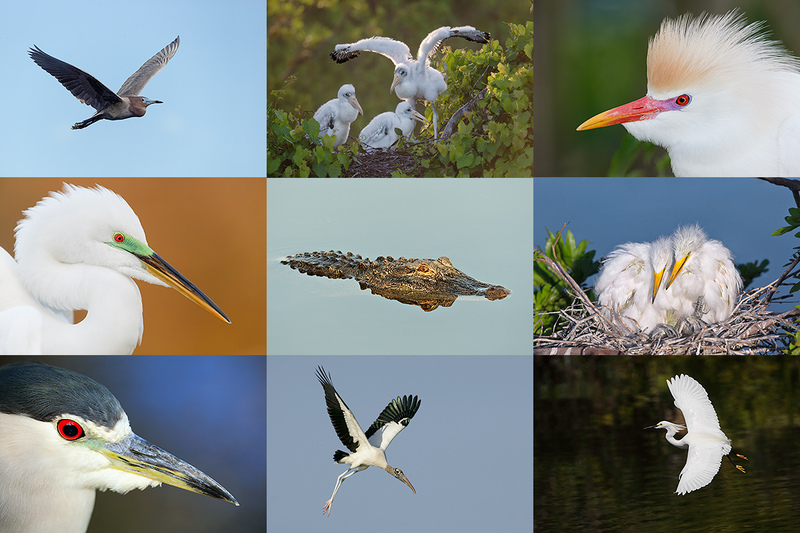 Without being able to think and work quickly, to be fully aware of the various options available with the 200-400/1D X combo, the displaying heron image would never have come to fruition. Learn to use your gear, explore all of the options in our great eGuides, and then practice, practice, practice. Rookeries are cluttered places. Murphy’s Law of Nests (every nest has one stick or twig in the wrong place…) prevails. On the Gatorland In-the-Field Saturday Workshops I teach folks how to tell the good situations from the poor ones and how to choose the best perspective. See below for details. For the image above you are invited to leave a comment and let us know what, if anything, you would choose to clean-up or eliminate. Please take a minute to leave a comment letting us know which of the 2 images here that you like best. And why. There are only 2 openings left on the April 5 ITF Workshop. But three folks are leaving early; if you are interested in an afternoon only session, please contact me via e-mail. Thank you for sharing your beautiful images of birds in your area and on your IPTs. I’ve never been to most of the places you shoot, and to get to see the birds and learn their names and see their breeding plumage is great. 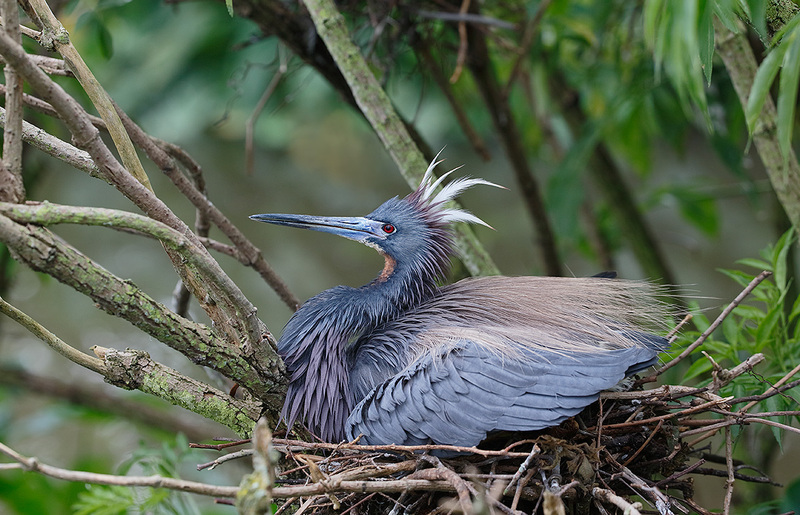 The Tricolored Heron is a beautiful bird. Art, not sure I could swing the cost of a new (or used 600 II ) with my relatively young family. What would you think about getting one of the original 600 mm lenses? And where? B&h used? Ebay? Sorry if I sound like a complete novice. I do the majority of my photography with a 7d and a 100-400mm canon. Art, I can only add that the 300 II is a superb bird-in-flight lens, with or without the 1.4 III extender. I like the nest image best, more interesting. In this same image the only thing I might remove are the out of focus foreground branches. Given how good the 200-400 is with both the internal and external 1.4 converters, and if I already owned an 800. Wouldn’t it make sense to keep the 800 rather than taking a significant loss by selling the 800 and buying a 600? Is a bare 800 slower at AF than a 600/1.4 combo? If you did not own a 800 I think the 600 is the better choice. Comments? Hey Walt, Good to see you here. I have written a ton including specific blog posts addressing the 600 vs 800 issue. Don’t get me wrong, the 800 is obviously a superb lens, but for me the increased versatility: 600, 840, and 1200mm trumps the 800/1120…. An excellent photographer with the 200-400/800 kit could obviously make tons of great images. Do note that it is a strain getting those two lenses down the beach. I know because I have done it :). On the AF question, probably equal with a slight edge probably to the 800 alone. I needed you the other day when there was a Better Beamer comment that I disagreed with, probably sometime last week. I just started using flash again after a 2-year vacation. Your date for Gatorland should be April 5th instead of April 4th. Beautiful images all. I really enjoy your blog and appreciate all your time and effort that you dedicate to it. Thanks Bob. Deep down, something about that date has been bugging me :). All fixed now. Never-the-less, 4 folks signed up and one more threatening to do so :). Hi, Art – the gentleman from the UK who was at Gatorland on March 15th will be returning there again with us this Saturday. His name is Roger Gordon; he is a retired portrait photographer from Stuart, FL – a wonderful fellow to be sure! Nice shots Artie. How close did you get with Image #1? Was that the absolute minimum focussing distance? How would you have implemented an extension tube if you wanted to go even closer? Wait, I see your answer in the post, thanks. Lens drive when AF impossible is covered in the 7D User’s Manual starting on pg. 25-26. Hi, Artie. Lovely images as always. I wouldn’t do a thing to the tricolored heron; the clutter in the area is an important part of the story the picture tells. I do have a comment on the lens choices you made and continue to make. Many of us here can’t afford (or justify) the cost of either the 600 f/4L IS II OR the 200-400 f/$L IS with 1.4X TC, let alone both of them. I guess you don’t have to limit yourself, but we do. It would be interesting at times to read your thoughts on what you’d do if you had only one lens with you. Artie…I play an instructional game with your image descriptions…trying to guess the evaluative metering correction, based on your exposure rules. The Tricolor Heron, above, has completely blown me away. I would have guessed a positive corrrection, if any, given the neutral BG, and small amount of white plumage. ps: that is a great way to learn. And I am glad that you had the confidence to say something! like the telephone pole growing out of a persons head. removing OOF branch to the right and above the beak. Unsure on the blackish branches.